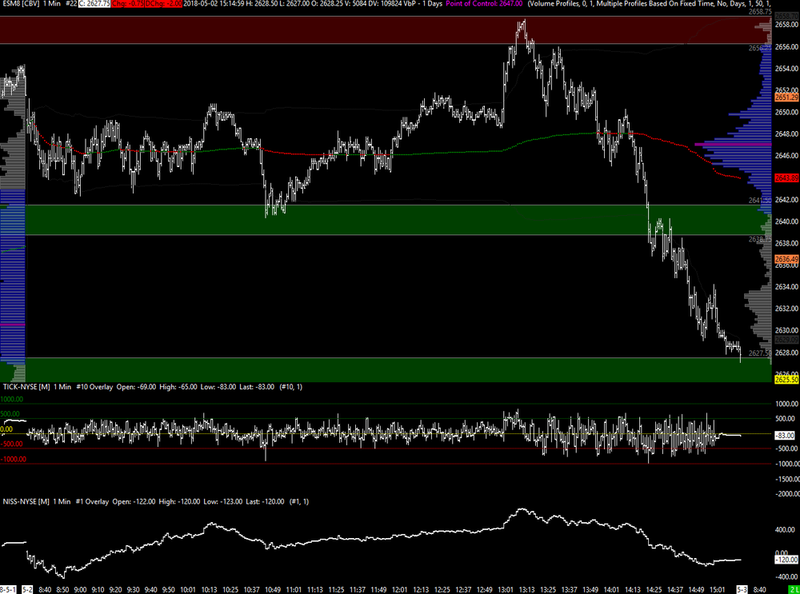 We got a decent range again yesterday with the main action after the FOMC minutes, which was to be expected. I've shown on yesterday's zones above the key reasons for the zone placement, though this is always done in context and is subjective. The failure on the rally to break above the late pullback high from Monday put sellers back in the driving seat as longs bailed out to push down towards Tuesday's low. Overnight so far the market has remained weak with the range currently 2617.00-36.25, selling off strongly in the past hour or so. If we see the sell-off continue after the open, the next key reference is last week's low at 2611.25. If it fails to accept below that I would be looking for shorts to cover and see a rally back up to the 2633-34 high volume area as one scenario I can see playing out potentially with the hotly anticipated employment report tomorrow. Holding below last week's low is a warning bell for longs or potential longs.